RCP Casting director and staff will be scouting all classes at WDM Spain & Italy 2017. This is an audition to work on their award-winning ships worldwide. Dates for casting is ongoing as well as start dates. SINGERS: RCCL is seeking professional seasoned singers with various vocal styles to include: Pop/Rock, R&B, Contemporary Musical Theatre/Broadway, and Jazz. The ability to act and phonetically speak other languages is a plus. (Spanish, Italian, French & Portuguese.) Singers will be required to present their best 16-32 bars of a ballad and an up-tempo in contrasting styles. No a cappella or accompaniment tracks permitted. An accompanist will be provided at the “live” auditions and sheet music must be in the proper key. Females should have a vocal range between G3 – C6 with a strong, controlled belt/mix up to an F5. Must also be able to produce sultry alto notes as well as the ability to sing light and floaty in upper register. Males should have a vocal range between A2 – A4 and must be able to sustain upper notes. Some role required strong falsetto up to an F5. Some singer positions will require dance/movement and all applicants should come prepared to learn a movement combination. Video submission applicants must also submit footage of previous performance experience showing various vocal styles and dance movement abilities. warmed up and ready to dance. 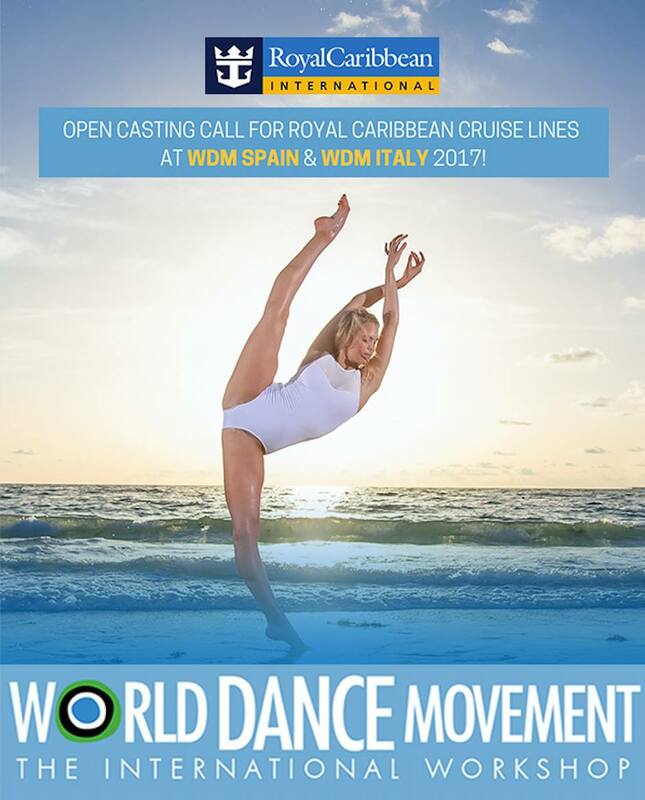 AUDICIÓN ABIERTA PARA LA COMPAÑÍA DE CRUCEROS ROYAL CARIBBEAN DURANTE WDM SPAIN 2017! 11AM en TheInstitute of theArts Barcelona C/RamonDalmases, 18, 08870 Sitges, Barcelona, España. 7PM en TheInstitute of theArts Barcelona C/RamonDalmases, 18, 08870 Sitges, Barcelona, España. Todos los cantantes deberán pre-registrarse antes del día 1 de Junio para la audición en España o 1 de Julio para la audición en Italia enviando un correo electrónico a info@worlddancemovement.com para registrarse previamente. El director de casting de RCP junto con su equipo estarán observando todas las clases a WDM Spain y Italy 2017 en busca de nuevos talentos. Edad mínima para audicionar es 18 años. Todas las nacionalidades son aceptadas. This entry was posted on Viernes, marzo 10th, 2017 at 2:03 pm. It is filed under Uncategorized and tagged with acdn productions, acrodance spain, audition, dancer, royal caribbean cruise, singer, world Dance movement. You can follow any responses to this entry through the RSS 2.0 feed.